Trayvon Martin rallies were held across the country following the George Zimmerman not-guilty verdict. 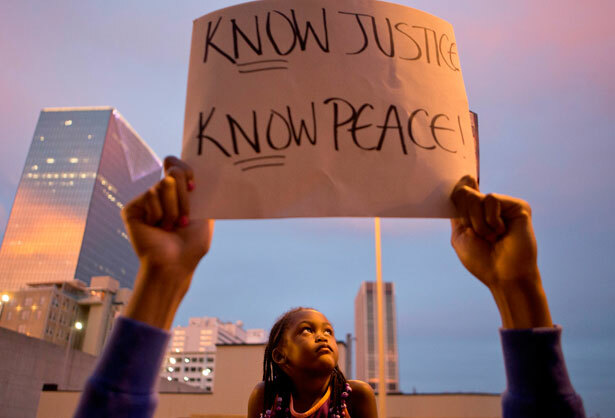 Rallies for slain teenager Trayvon Martin continued across the country on Monday, the third consecutive night of such protests following the acquittal of George Zimmerman. While the media at times seemed to be hoping for race riots, these gatherings have been overwhelmingly peaceful, and supporters of the Martin family say they have planned future demonstrations. Media pundits like Bill O’Reilly made breathless predictions that America would erupt in race riots following a not-guilty verdict, but that never happened—but sadly, the media probably would have devoted much more coverage to the vigils if they had turned bloody and violent. All the baseless speculation about black people running out to “cause trouble,” in the words of O’Reilly, does have a lasting effect in one sense: it conflates peaceful protest with crime. Now, a group of black people gathering to do no more than share their grief concerning a murdered teenager are viewed as inherently suspicious—even if they’re totally peaceful—partly because O’Reilly and company have droned on endlessly about the coming race war (that never came). Demonstrators flooded New York City’s Times Square, blocked a freeway and other streets in Los Angeles and set fire to a flag in Oakland during this week’s protests. Strangely, the Los Angeles Times writes that other protests around the country were “largely peaceful,” but gathering in Times Square isn’t a crime or particularly un-peaceful and burning the flag is a form of protest protected by the First Amendment. While blocking traffic might frustrate commuters, a large part of civil disobedience entails disrupting the normal flow of every day life. Otherwise, what’s the point of protesting if no one even notices the activists are there? It’s important the media not conflate overwhelmingly peaceful protests with bloody riots so the real acts of violence, say the murder of a 17-year-old teenager, stand apart as the horrendous acts they are. Rather than anger, many who attended the rallies expressed sorrow and fatigue with a justice system that remains rigged against people of color. In Minneapolis, thousands packed the People’s Square outside the Government Center. Kyle Mason, 22, told CBS that outcomes like that of the Zimmerman criminal trial seem all too familiar in the African-American experience. “The recent events of Trayvon Martin really bothered me but they don’t surprise me, which makes it even more bothersome,” Mason said. Mason says people of color in the United States are accustomed to being judged or criminalized because of the color of their skin. “It’s painful but it’s nothing new, you know. It’s a tired, old story,” he said. More than 200 people gathered Monday night near Kansas City’s Freedom Fountain. Hundreds marched peacefully in Chicago in response to the verdict. “I believe this is the case that will…anger black America to do what’s necessary to obtain those rights that we’re being stripped of, just like when Emmett Till was murdered and there was a movement and we made progress,” Taylor told the paper. “We know driving while black, walking while black, Trayvon Martin was killed because he was existing while black,” demonstrator Marilena Marchetti told Fox Chicago. The Rev. Al Sharpton announced on the Today show that his organization is planning a 100-city vigil for Trayvon Martin that will take place in front of federal buildings across the country on Saturday. One such vigil will take place outside the Detroit and Flint offices of the Department of Justice led by Rev. Charles Williams II, head of the Detroit chapter of the National Action Network and senior pastor at Historic King Solomon Baptist Church in Detroit. “We are looking for justice,” Rev. Williams told the Detroit Free Press. Arnold Reed, a junior at the University of Michigan, and the Black Student Union helped organize a forum and candlelight vigil Monday night at the university. When speaking with the Detroit Free Press, Reed described the plethora of emotions experienced by Martin’s supporters. The protests and vigils held around the country in Trayvon Martin’s honor helped turn a devastating event into a rallying cry. Read Mychal Denzel Smith’s account here.